Discussion in 'News & Rumours' started by CrashCoaster, Mar 23, 2019. What do people think will replace it? I could easily see it replaced with an S&S 4D Free Spin, perhaps with the same name and theme? Who knows at this point. Had this confirmed to me before this happened. Gal Gadot is a sneaky little devil that would snuggle in perfectly. Antinos, Hutch and Matt N like this. Magic Mountain not completely whoring roller coasters to have the most in the world?! Ah, so now we know what Six Flags America will get. There was a thread on that, wasn't there? Also, chalk the ZacSpins up as another Intamin invention that looked promising when it debuted, sold well for a while and then just died. Three built in two years, then one more two years after that (this one), then no more. And now one is being taken down again. More or less like the Surfriders, or the Impulse Coasters before them. I wonder what the next Intamin boom-and-bust thing will be? If these are as bad as the S&S ones then it's no loss. Ew it must be bad then. Really hate those S&S ones lol. To be fair to Intamin they are still at least selling Impulse and Surf Riders. Slowly I admit but there is one of each under construction right now. These however were a huge dud even if i quite liked the one i did. Never understood the hate for these. I for one love Insane at Gröna Lund. Aw, this makes me feel a bit old, considering the very last thing I've experienced in an American theme park was being denied a ride on this coaster a month after it opened. Aye, but Insane is by far the best of the lot. 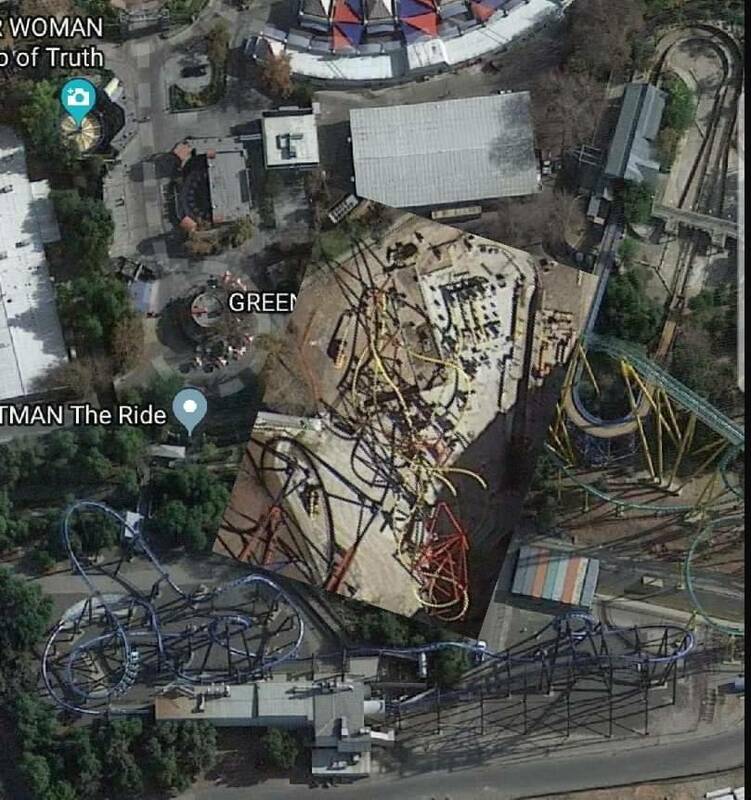 Six Flags throttled the spinning (and more?) on theirs - rendering them even worse. I mean, I don't love them as a ride type - just nauseating and head full of blood. Gross, really. Meh, hopefully they do something with the plot, I guess. Removing a coaster after only seven seasons in operation makes it sound like quite a failure. I mean, the park still keeps Ninja and Viper around as part of their white-knuckle lineup, 30 years after they opened, despite having little historic value. And a couple of the family coasters are decades older than that again. I suppose the fact that Ninja and Viper can eat through people probably helps their case, while Green Lantern has a terrible throughput. Kw6sTheater and TilenB like this. Insane was much better anyways. I wonder if they'll relocate this or just get rid of it. I could tell during my lone ride on this that it had a lot of potential. It was a pretty scary experience feeling my coach rocking back and forth while slowly approaching the sudden dive down to the level below. Despite that, the ride had too many opportunities for lots of discomfort in many areas. I ended up traversing the entire big valley prior to the brakes literally upside down. It kinda hurt. Contrast that with The Joker and its clones that have been spreading like wild fire. There may not be that anxious approach into one of the dives, but the ride's profile does a better job at considering rider comfort. There really aren't any places for a coach to get balanced upside down, and the flips are nicely controlled such that they still feel fluid. They may not be quite as intense as Green Lantern, but they're much more fun. Apparently La Ronde execs were seen at the park watching the ride test a few days ago. Maybe this is a replacement for their Intamin standup that closed last year? Even the regular Wonder Woman clone would have a better throughput Green Lantern lol. People should really be careful what they ask for...this is still Six Flags. They could slap a Super Loop or Skywarp in there and call it a day. I hate these and I hate the S&S ones, too. They can all just go away. Yep. I though I quite liked the S&S ones after one ride on Arashi, but then I did more of them over the summer and I'm not a fan. They can all f**k right off.